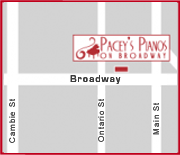 Pacey’s Pianos serves Surrey piano store, providing new and used pianos in Surrey, Delta, White Rock, Langley, Fort Langley and elsewhere. We cover all areas in the Fraser Valley from New Westminster to Mission. Our showroom on East Broadway in Vancouver displays some of the finest pianos in the world including Mason & Hamlin, Schulze Pollmann, Knabe and used Yamaha pianos at outstanding prices and we delivery to all areas in the Fraser Valley. Further, we provide full service to the Surrey area including piano moving, piano tuning, piano service, piano restoration,and piano rentals. We are the Surrey piano store.